Clay is used cosmetically in topical packs and masks for their rejuvenating and cleansing effects. The rich mineral content of clay is nourishing to the skin. Each type of clay has different properties. White Kaolin clay is astringent, stimulating the lymphatic system as well as the blood circulation. It is best for normal to oily skin. 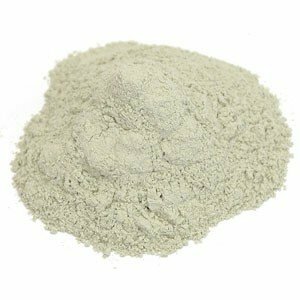 French green clay is the finest of clays and is very versatile. It can be used for dry or oily, or even combination skin, as it has a balancing effect. In aging skin it has a rejuvenate effect. It is soothing to the skin, leaving it silky to the touch. It is rich in calcium, magnesium, potassium and sodium. Applications: To make a beauty mask, try the following or design your own. Blend 1 ounce by weight of French green clay with enough water to make a paste, then add 2 teaspoons of jojoba oil, 6 drops of carrot seed essential oil, 5 drops of German Chamomile essential oil, and 2 drops of rose essential oil. Cleanse face with a gentle soap (such as goat's milk or olive oil soap) first, leaving it slightly damp. Then spread the mask gently but completely over the face, leaving it on for up to 15 minutes. Then, gently scrub off the the mask, using a bath cloth or (even better) an exfoliating scrub. Your pores will be cleansed and your skin renewed and satin to the touch!